Pablo Fajardo lives in northeastern Ecuador. He cherishes his community and the beauty of the surrounding Amazon rainforest. When he learned that his neighbors' livestock were dying from falling into petroleum pits and people were falling ill from polluted water, he knew he had to do something. He was only 16, but he became a leader of his community and called on the government to act. Officials told him that the only way to get results was to hire a lawyer. So he went to law school. Twenty years later, Pablo is still fighting to protect communities from devastation caused by oil extraction in Ecuador that began before he was born. 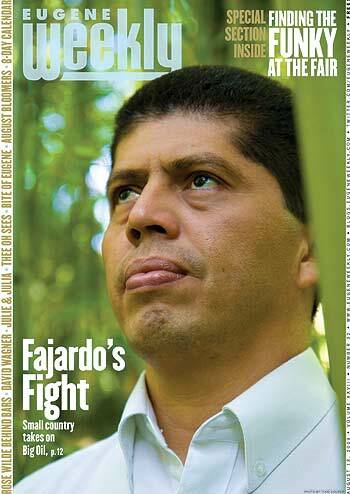 Today's Eugene Weekly has Pablo on the cover and reporter Camilla Mortensen does a fabulous job telling his story and detailing the controversy surrounding the destruction of the Ecuadorean Amazon. The Environmental Law Alliance Worldwide is honored to host Pablo as an ELAW fellow this summer. Many thanks to the University of Oregon's Wayne Morse Center for Law and Politics and the American English Institute for making Pablo's visit possible. If you are in the area, we hope you will join us at the Lord Leebrick Theater on August 27 to meet Pablo and hear more about his inspiring work. Learn more about the upcoming event here. If you can't make it and want to read more, check out William Langewiesche's report in Vanity Fair.